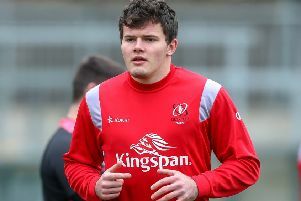 Joe Schmidt hopes Johnny Sexton will shake off a head injury in time for Ireland's Guinness Six Nations trip to Italy. British and Irish Lions fly-half Sexton lasted just 24 minutes of Ireland's fraught 22-13 victory over Scotland at Murrayfield on Saturday. The 33-year-old failed a Head Injury Assessment (HIA) and Joey Carbery came on, stepping up to set Keith Earls free for the winning score as Ireland hit back from last weekend's 32-20 defeat to England. Head coach Schmidt later downplayed the extent of Sexton's injury as he said: "Johnny failed an HIA, he just banged his head in the build-up to our second try, he just fell pretty heavily. "He seems to be doing quite well now though, so we're hopeful he'll be okay for the next game (against Italy on February 24). "He copped a stamp at one point; I don't even think it was a Scottish foot, I think it was one of our guys who tripped over him. "He got two knocks so they were cumulative, and he has a swollen ankle, but that's just swelling and he should bounce back from that pretty quickly." Admitting Ireland expected Scotland to single out Sexton and attempt to shut him down physically, Schmidt insisted that worked to the visitors' advantage. Sexton's cute inside ball sent Jacob Stockdale haring clear for Ireland's second try, leaving Schmidt happy with another training-ground ruse come good. Schmidt was phlegmatic on Scotland targeting Sexton, replying: "It was going to happen, and Johnny probably knew he was only going to play 20 minutes so tried to cram it all into one quarter! "That pass release for Jacob's try was perfect, the guy maybe could have got to Jacob if not for that intent in trying to get to Johnny. So sometimes that works to our advantage. "We felt that if we got the ball into Peter O'Mahony's hands they would think he was just going to carry round the corner. "So for Johnny to come back and strike round that side of the ruck might be an option. "Mostly we would strike on the other side of the ruck, so we thought it might be an opportunity. And there's no better man to get it in his hands than Jacob."